This groundbreaking volume introduces readers to the key concepts and debates in deaf studies, offering perspectives on the relevance and richness of deaf ways of being in the world. 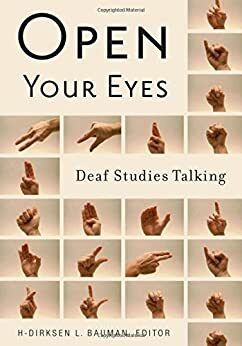 In Open Your Eyes, leading and emerging scholars, the majority of whom are deaf, consider physical and cultural boundaries of deaf places and probe the complex intersections of deaf identities with gender, sexuality, disability, family, and race. Together, they explore the role of sensory perception in constructing community, redefine literacy in light of signed languages, and delve into the profound medical, social, and political dimensions of the disability label often assigned to deafness. Moving beyond proving the existence of deaf culture, Open Your Eyes shows how the culture contributes vital insights on issues of identity, language, and power, and, ultimately, challenges our culture’s obsession with normalcy. Contributors: Benjamin Bahan, Gallaudet U; Douglas C. Baynton, U of Iowa; Frank Bechter, U of Chicago; MJ Bienvenu, Gallaudet U; Brenda Jo Brueggemann, Ohio State U; Lennard J. Davis, U of Illinois, Chicago; Lindsay Dunn, Gallaudet U; Lawrence Fleischer, California State U, Northridge; Genie Gertz, California State U, Northridge; Hilde Haualand, FAFO Institute; Robert Hoffmeister, Boston U; Tom Humphries, U of California, San Diego; Arlene Blumenthal Kelly, Gallaudet U; Marlon Kuntze, U of California, Berkeley; Paddy Ladd, U of Bristol; Harlan Lane, Northeastern U; Joseph J. Murray, U of Iowa; Carol Padden, U of California, San Diego. H-Dirksen L. Bauman is professor and director of the graduate program in Deaf Studies at Gallaudet University. He is coeditor of Signing the Body Poetic: Essays in American Sign Language Literature, executive editor of the Deaf Studies Digital Journal, and executive producer and codirector of the documentary film Audism Unveiled. 5.0 out of 5 starsBoring book, but did its duty. I had to use this book for a sign language class. The reading was a snore, but that's just the nature of the beast. Studies aren't known for being thrillers, exactly. But it was a good learning experience, and it served the purpose for which it was intended. This is a must have book for your library. I still look at if often. It gives the best insight to deaf culture that I have seen. Very eye opening, gave new perspective into the Deaf culture.